It’s been about six weeks since the departure of MO‘s former Editor-in-Chief, Kevin Duke, who has been toiling at his new gig at The Brand Amp, a SoCal-based PR agency. As a production manager for the agency’s content department, Duke has primarily been working on behalf of Indian Motorcycles to produce video content used across Indian’s various channels. All the while, making us jealous of his close contact with the Indian FTR750. Riding The Indian Scout FTR750! Today, we came across the video below, which was just published on Indian’s YouTube channel. The video offers a quick look at Indian’s FTR750, the bike that has been dominating the American Flat Track series since its debut in 2017. It includes interviews with Indian’s top racers, Brad Baker, Bryan Smith and reigning AFT champ Jared Mees, shot at AFT’s season-opening round at Daytona a couple of weeks ago. 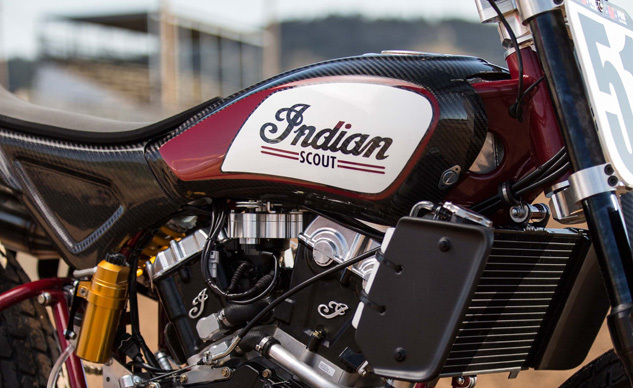 Duke says there are more vids about Indian’s flat-track efforts in the hopper, as well as other projects centering around the development and processes behind Indian Motorcycle’s production bikes. Judging by this video, there should be entertaining stuff ahead. Of course, Kevin would encourage everyone to subscribe to Indian’s YouTube channel as to not miss any of the new content coming in the future. In the meantime, take a look at the fruit of Kevin’s loins, er, labor, below.